It is because of the lack of family worship and the transient nature of the family that we must be more intentional about partnering with families like never before. Most conversations I have with other kids pastor, and youth pastors about partnering with parents usually end in agreement that it should be done but at a loss for how to make that happen. We have tried things over the years that didn't work. One of the mistakes I made over the years was to create programs or resources that didn't meet the needs of the families I serve. They were good but not strategic. I was answering questions parents weren't asking. What if in partnering with parents we don't try and create programs and resources that meet our needs but what if we answered questions our parents were asking? I think part of our problem in partnering with parents is we are giving them things that aren't useful or are only helpful to some. Parents don't need more info. If you have three kids in school at any given time, you will be buried under the avalanche of things to do things to be signed, and that doesn't even include everything for every sport or activity. What if we stopped giving them information about that we think they need and start answering questions they keep asking us. What if we took that question and asked: "Does this need to be a program or a resource?" We have a few of these in our church our Baby Dedication is a program and a resource, our baptisms are a program and a resource. 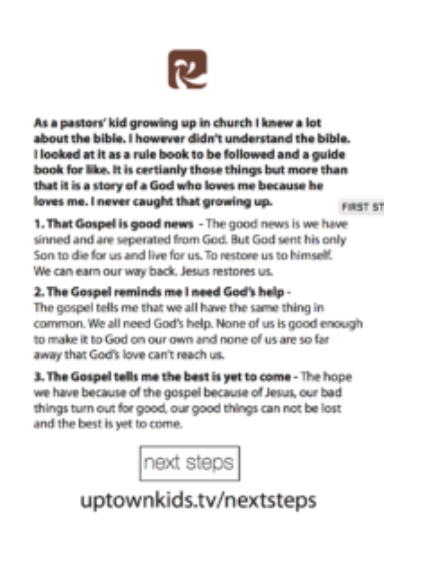 This last week we put the final touches on a resource that we have worked on for a while. We call it first steps, next steps. The idea is to give three short answers to questions our parents ask us often as a "First Step." Just enough to be helpful but not too much to overwhelm. If people want more than those three short answers provide we have "Next Steps" which is a website with a six to eight-page paper available to elaborate on the question that the three questions only begin to cover.